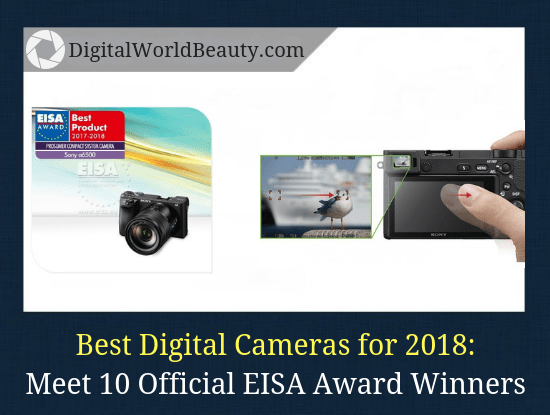 This roundup of the best cameras for 2017-2018 includes 10 official EISA Award winners. If you’re remotely interested in digital cameras and photography, you will rightly wonder what the top rated cameras for 2018 would be. … this list will present digital cameras from all categories. And ALL of them were officially chosen by the EISA specialists. What is this EISA thing that I keep mentioning? The European Image and Sound Association (EISA) is an organization of 53 specialist CE magazines from 25 countries. Every year, member magazine experts get together for an EISA Awards event and celebrate the products that combine the most advanced technology and desirable features with class-leading performance. The EISA Awards extend from the most affordable, high value products to the most aspirational expressions of modern consumer electronics. Let’s further examine each of the camera winners. 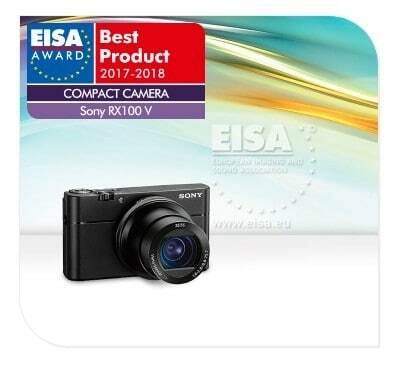 At the EISA Awards event, Sony a9 was voted as the best camera in 2017-2018. Sony a9 is a high-speed digital camera that’s designed to go head to head with Canon and Nikon’s flagship professional DSLRs. 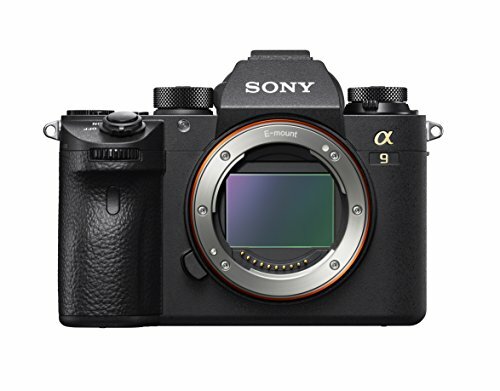 Note: Even though the camera is called “α9” (Alpha 9), the official name of the model is ILCE-9. This full-frame mirrorless camera features a 24MP stacked CMOS sensor which allows 20 fps burst shooting and provides a completely silent operation of the electronic shutter. Video shooting can be in 4K format at 30 fps, and in FullHD format – up to 120 fps. The Sony a9 camera can record up to 200 RAW frames at a speed of up to 20 frames per second, with no image loss in the viewfinder (“blackout”). It is noted that the calculation of auto focus and auto exposure is performed at a frequency of 60 times per second. And the auto focus system uses 693 built-in phase detection sensors, covering more than 90% of the frame area. Without doubt, Sony a9 will appeal to the lovers of continuous shooting. Are you into sports photography? This camera will show itself best, for example, at sports competition events for the most successful shots of jumping or running. … Clearly there is a huge potential there. According to the manufacturer, Sony a9 is the most functionally powerful camera of all existing, both mirrorless and DSLR cameras. With this positioning, its high price tag doesn’t seem surprising. If you are looking for the “complete package”, then the Sony a9 camera price will definitely justify itself. 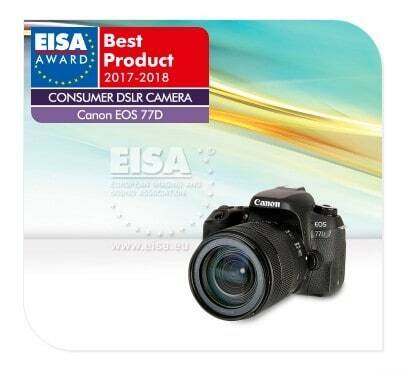 Canon EOS 77D was recognized as the best consumer DSLR camera. The camera doesn’t belong to any of the established DSLR line of its manufacturer. 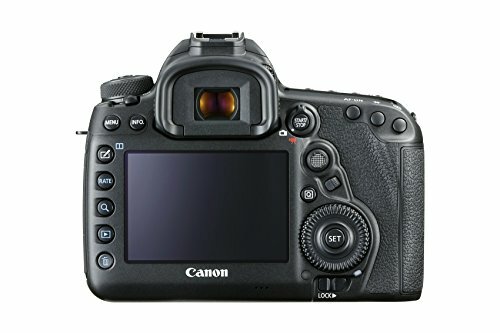 It’s positioned as an intermediate option between the amateur EOS 800D (Rebel T7i in the Americas) and the advanced, large and powerful EOS 80D (see image below). This novelty is especially relevant to our market today. Because the prices for photo equipment drastically increased, yet many people want to be creative with photography and have an affordable “adult” camera with necessary functions. This way Canon EOS 77D builds a bridge for amateur photographers into the world of serious photography equipment. and 45 points when viewed through the viewfinder. In 2015, Canon released a special modification of the Canon EOS Rebel T6i (750D): The Rebel T6s (760D). Basically, T6s was an inexpensive entry-level camera with advanced control functions. Apparently, the experiment was considered successful. It was then decided to allocate such cameras to a separate segment in the next generation. And the result of the development of this idea is the Canon EOS 77D. As mentioned already, the camera is based on a 24-megapixel CMOS-sensor with support for Dual Pixel CMOS Auto Focus technology. This Auto Focus technology is responsible for the fast and accurate focusing for both video and still photos in Live View mode. A very solid feature not only for the amateur, but also for the semi-pro class. Canon EOS 77D is equipped with a new DIGIC 7 processor, which delivers high precision tracking performance and allows for touch detection of image subjects. It also has a great range of photo sensitivity that you will surely enjoy. Due to the presence of controls inherent in professional cameras, the EOS 77D is an excellent choice when buying your first camera. and at the same time it allows you to perform some serious creative tasks. A sort of golden mean, an ideal compromise. 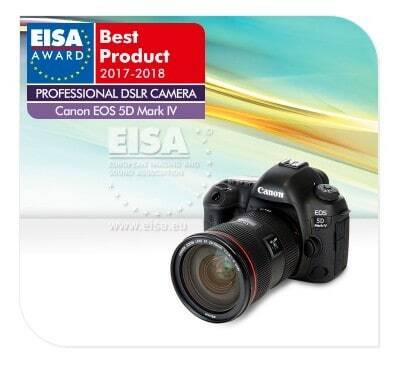 Canon EOS 5D Mark IV was recognized by the EISA as the best professional DSLR camera. The Canon 5D Mark IV was one of the most anticipated cameras. 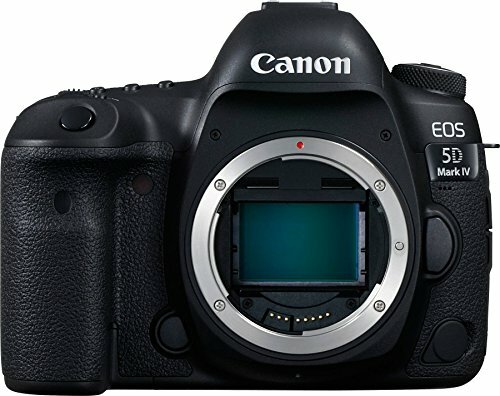 Four years after the release of EOS 5D Mark III, Canon released a next-generation camera capable of repeating the success of the legendary “third Mark”. Winning the EISA Award proves it right. Well, the whole secret lies in the equally wide versatility of the Canon EOS 5D Mark IV. The “fourth Mark” borrowed this feature from its predecessor, but became a bit better in everything. First of all, Canon EOS 5D Mark IV has a 30.4-megapixel full-frame CMOS sensor. And even though the resolution of the images increased to 30 megapixels, this did not affect the quality at all. 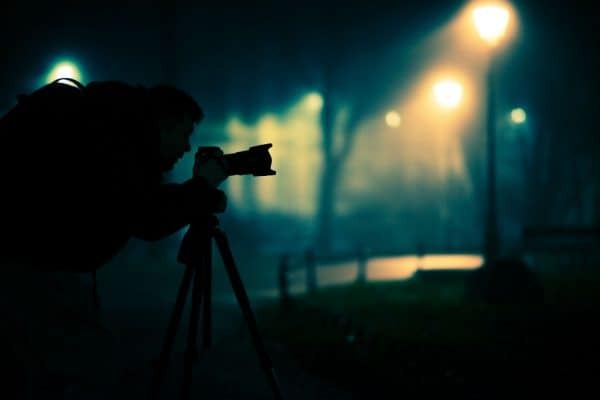 The camera confidently captures images at ISO up to 6400, but if you want to publish your photo on the Internet, it can provide good quality at much higher ISO values too. And when you make adjustments to a RAW file, there is almost no noise in it. A novelty for the whole photo industry was Dual Pixel RAW. Essentially what it does is it simultaneously takes two photos, both 30.4 megapixels in size, using the left and right halves of a single pixel. During Dual Pixel RAW shooting, a single RAW file saves two images into the file. Because these two images see things a bit different, Canon lets you adjust/filter information from them separately. Thanks to this, in the post-processing stage, you have the opportunity to slightly shift a photo’s focus and bokeh (background blur). The auto focus system is close to the top Canon EOS-1D X Mark II in terms of its capabilities. (This also applies to focusing through the viewfinder, and focusing on the image sensor). The same function is fully functional for video shooting. Enhanced focus and metering functions of the EOS 5D Mark IV camera will not miss the moment and capture it even in difficult lighting conditions. Recording functions in high definition expand the possibilities of video shooting of this digital SLR camera. from photo hunting to professional video shooting. A touch screen definitely makes it more convenient to shoot. It’s Dual Pixel CMOS AF technology will focus on a subject instantly, even in very low light situations. 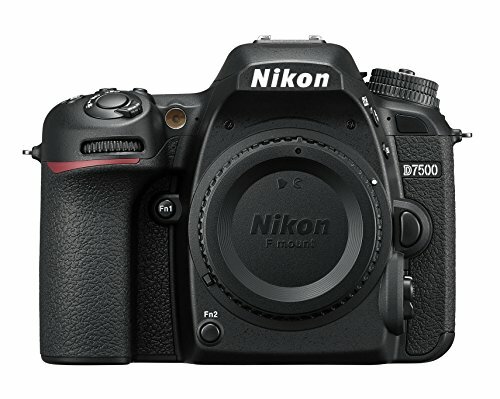 Nikon D7500 was voted as the best prosumer DSLR camera. and an 180000-band RGB metering sensor. It can shoot video in 4K format and it has improved dust and waterproof design. and a large monochrome LCD. See, these features stressed its semi-professional character. The new Nikon D7500 became lighter, has a powerful sensor, EXPEED 5 image-processor and 180K-pixel RGB sensor used in Nikon’s “top-dog” D500. As a result, these features made D7500 an excellent camera choice of its class. a large image buffer of 50 Raw files or 100+ JPEGs. … Which are a good acquisition for a camera of this level. I think that the D7500 will appeal to many photography enthusiasts who can appreciate and use all the technical abilities of the camera. With technical characteristics that it has, D7500 is very close to the professional camera level. 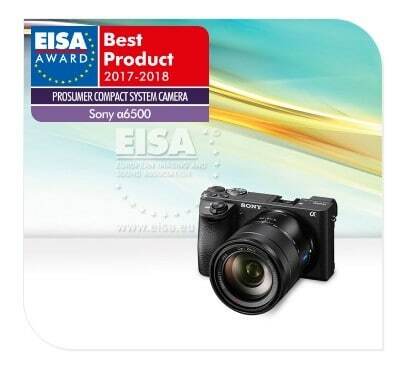 As the best prosumer compact system camera, the EISA Award was given to Sony a6500. and includes a fast 425-point phase-detection auto focus. Another innovation is the image stabilization system, which compensates for the displacement along the five axes. 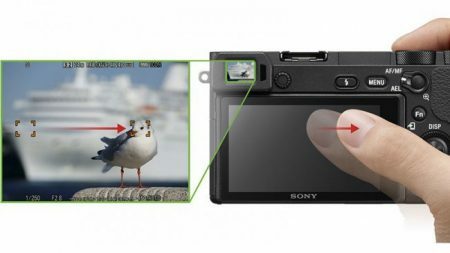 The new Sony model inherited a hybrid focus system from its predecessor, the Sony a6300, however the a6500 model now allows you to select the focus points with its touch screen. … This allows you to select the focus area with your finger, while still keeping your eyes on the viewfinder (see image below). An important improvement was an increased buffer for images. Now it allows producing continuously up to 307 frames in JPEG format and 107 frames in RAW format. The speed of the continuous shooting is 11 frames per second (or 8 frames per second with refocusing and exposure metering for each frame). In terms of combined consumer characteristics, the previous Sony model is noticeably inferior to the new Sony a6500. 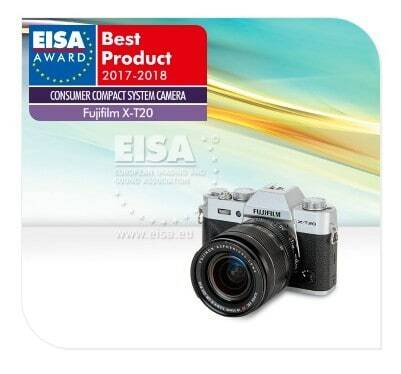 Fujifilm X-T20 was voted as the best consumer compact system camera 2017-2018. The features of this camera make it a great choice for hybrid shooters. Besides having an awesome 24-megapixel X-Trans CMOS III sensor, Fujifilm X-T20 is equipped with new autofocus modes for shooting moving objects. and continuous shooting at 14 frames per second. According to the figures, the characteristics of Fujifilm X-T20 differ little from the characteristics of the flagship camera: The X-T2. A new Fujifilm camera came out in March 2018, see our first impressions review of Fujifilm X-H1 camera. Having held both X-T20 and X-T2 in your hands, you immediately understand which camera is for amateur shooting, and which camera is of a professional level. The former is noticeably smaller than the flagship, has a less pronounced grip and a smaller viewfinder. and do photography for the sake of pleasure, not for money. What make it simple for beginner photographers? In the X-T20, there is now an advanced AF system. Also, 4K was added which improved its video recording capabilities. Did I mention it’s a great choice for hybrid shooting? Good autonomy coupled with compactness and the ability to charge from USB makes the X-T20 an excellent camera for shooting on a trip. Free applications FUJIFILM Camera Remote and Wireless Communication allow you to take pictures remotely from your smartphones and tablets (via Wi-Fi). 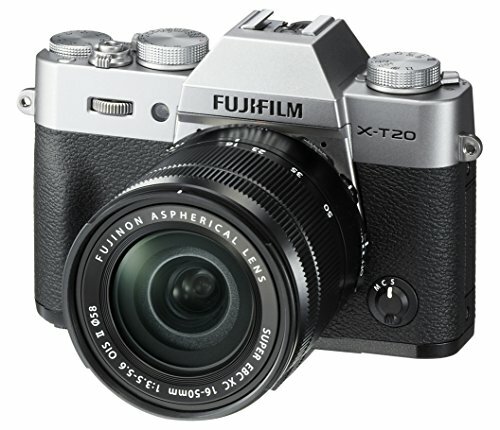 Fujifilm X-T20 can be considered as a second (mirrorless) option for a professional. and the possibility of silent shooting. Fujifilm X-T20 is stylish, compact, fast, and easy to use camera. The camera has a fairly affordable price, yet there are features taken from the flagship X-T2 which will be more than enough to help you develop your photography skills. See what other people have to say about it. Fujifilm X-T20 was not the only camera that won EISA Award this year. 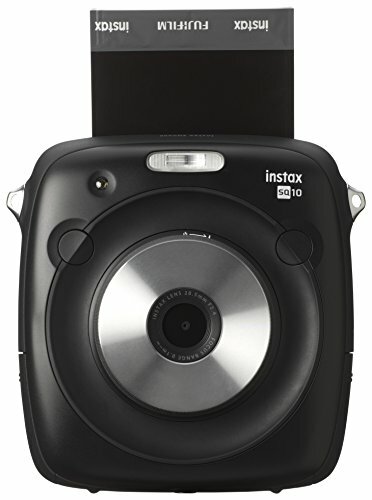 … Which won an award as the best instant camera in 2017-2018. Instax Mini 8 was an interesting camera but had a number of shortcomings with it. … Which is by far the most advanced instant camera available out there. The design of Fujifilm Instax Square SQ10 resembles the icon of the Instagram social network, with the emphasis on photography. By the way, even the format of the photos themselves from the camera and in this network is similar (62 by 62 mm). Having a TFT display made it possible to configure the operation of the camera. and adjust the brightness and contrast. Its internal memory is enough for about 50 pictures, you can expand it with a memory card up to 32 GB. The memory card slot can be useful for storing captured images or downloading files. 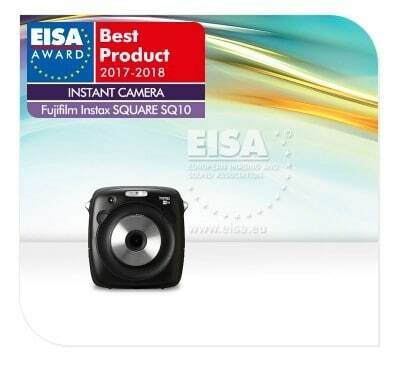 Fujifilm Instax Square SQ10 is more functional than its predecessor but so did increase the price for it (expectedly). Here is the competition with smartphones and digital cameras which have more capabilities and better image quality for the same price. 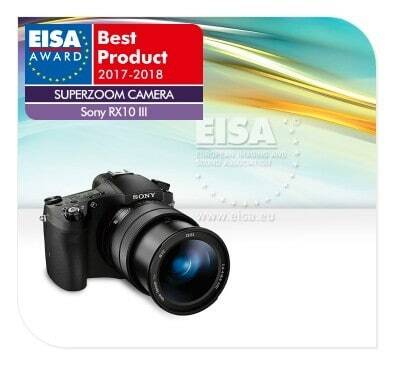 Sony RX100 V was another EISA Award winner. It was voted as the best compact camera. Along with the flagship mirrorless a6500 (see “best prosumer compact system camera” above), Sony released the fifth reincarnation of the popular compact camera series RX100. The new Sony RX100 V has the world’s fastest auto focus and the largest number of focus points, as well as the fastest continuous shooting – all among the cameras of the same class. Sony RX100 V uses a 20-megapixel sensor Exmor RS BSI CMOS format 1″. The BIONZ X processor works together with a new LSI chip, which maximizes processing speed and improves image quality at high ISO values. The ISO sensitivity range is 125-12800, but it is possible to expand it down to ISO 80. All electronic stuffing of the camera is designed with an emphasis on maximum speed. The hybrid autofocus system uses 315 focus points, which cover 65% of the sensor area. These 315 points, as well as the focus speed – 0.05 seconds – set a new record bar for compact cameras. 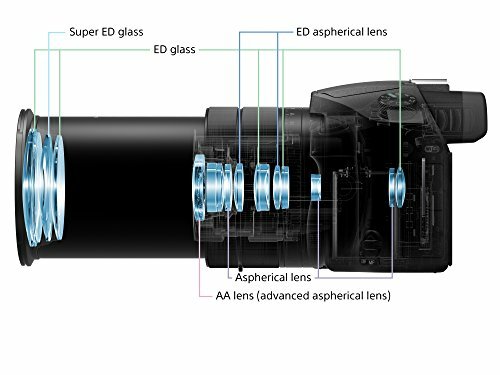 The camera features the Anti-Distortion Shutter function with a shutter speed of 1/32000 seconds that minimizes the effect of the rolling shutter and allows you to take pictures at a fully open aperture at an illumination level of up to EV19. Sony RX100 V has a ZEISS 2.9x optical zoom with a focal length range of 24-70 eq. mm and a f/1.8-2.8 focal length. 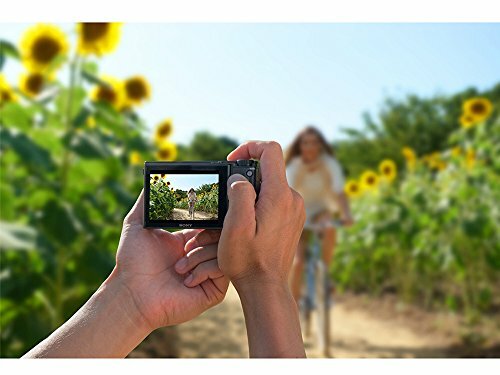 Sony RX100 V is a miniature device that continues the evolutionary line of the company, and it is able to fit in your pocket. By this criterion, there perhaps no analogues on the market. It’s a compact with the features of a professional camera. For those who need a compact camera, this “toy” is the best one available on the market. Sony cameras won a lot of awards this year. And the winner as the best superzoom camera was Sony RX10 III. In 2016, Sony released RX10 III, a compact camera with a powerful 25x optical zoom. The RX10 III uses a 20.1-megapixel Exmor RS CMOS sensor, as well as a BIONZ X processor – like the previous RX10 II. The lens has a focal length range of 24-600 eq.m. m and a f/2.4-4.0 aperture. Among other technical characteristics of Sony RX10 III are ISO sensitivity range 64-12800, high-speed video shooting up to 960-1000 frames per second (in reduced resolution), which gives a slowdown by 40 times during playback. and an integrated Wi-Fi module supporting NFC technology. The RX10 III tries to offer a lot in one package and it succeeds in that. No one yet withstood the competition with Sony’s fast sensor in the category of superzoom cameras. The camera turned out to be interesting, and despite its high price tag, it will find its buyer among the amateur photographers. Finally, we got to the last EISA Award winner. 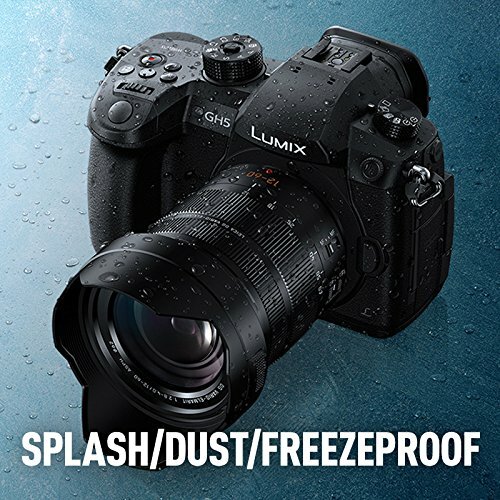 Panasonic Lumix DC-GH5 was voted as the best photo and video camera. Panasonic Lumix DC-GH5 has a 20.3Mp sensor, that was previously used in GX8 model, but the low-pass filter was removed from it. It also has a 5-axis in-body image stabilization system with ‘Dual IS 2’ support. Panasonic also added a 6K photo mode that shoots the movie at 30 frames per second. For RAW shooting, a series of 80 frames is offered, for JPEG there are no restrictions. An interesting feature is that you can record simultaneously on two memory cards or by selecting a priority for each of them individually. On one there can be a video, on the second there can be a photo. The camera shoots video in 4K resolution at a rate of 50 frames per second with a bitrate of 150 Mbps. There is an uncompressed shot with a bitrate of 400 Mbit/s 10 bits. Full HD can be shot at a speed of 180 frames per second. Bitrate up to 200 Mbit/s 10 bit. The extensions available are MP4, AVCHD, MOV. There is a dust and moisture protection. Therefore, a randomly-started rain will not damage the camera. In addition to that, in can be used in winter time without any problem. Without doubt, you’ll need weather-sealed cameras for landscape photography. Wireless control via Wi-Fi is supported. The Bluetooth module paired with NFC. This means that you can transfer the captured images to your smartphone and then share it on your social network account without using a desktop PC. Cameras of Panasonic Lumix GH family are very popular among bloggers, journalists and those who are fond of video shooting. GH5 became noticeably better, more functional and more expensive. and are excellent for wedding and reportage shooting. 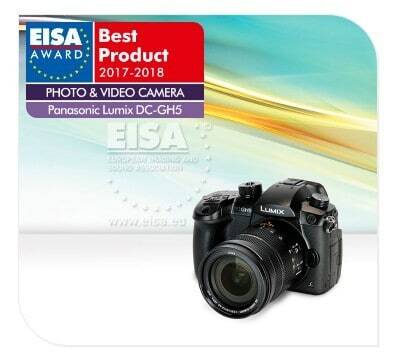 Based on the information that you just saw on each of the EISA Award winners, it becomes clear that the EISA Awards members were very careful in their selection of the “best of” cameras. Depending on your likes, needs and photography skills, you will find the camera that suits you best. If you are on a smaller budget or just starting to gain experience in photography, check out our list of the best cheap (compact) cameras for 2018.
what is your level of photography skills? are you into mirrorless cameras or DSLRs? overall, what was your favourite camera from this EISA Awards list? Whatever your thoughts and/or suggestions are, let us know in the comments! The Sony a9 certainly sounds impressive, and you sound very knowledgeable. If I may, a couple of questions? 1. What is a “mirrorless camera”. What is the advantage of a mirrorless camera over a a camera with a mirror? 2. What is a “prosumer”? 3. If I want a good camera for adding photos to my website and shooting YouTube videos, do you recommend I buy a Sony a9? What advantages will it give me over a Go-Pro or the camera on my Samsung Galaxy Note 8? Many thanks for your input, and for a very solid article. Hi Ephraim and welcome to my new blog about digital technology. Sony a9 definitely is great – I also liked the instant camera Fujifilm Instax Square SQ10 as it gives me associations with my childhood (my parents had an instant camera then). Besides, it’s kind of “exotic” in our pretty much digital world. 1. To be honest, the first question calls for an entirely new post – which I will probably include sometime in the future. I will try to explain it shortly and to the point though. 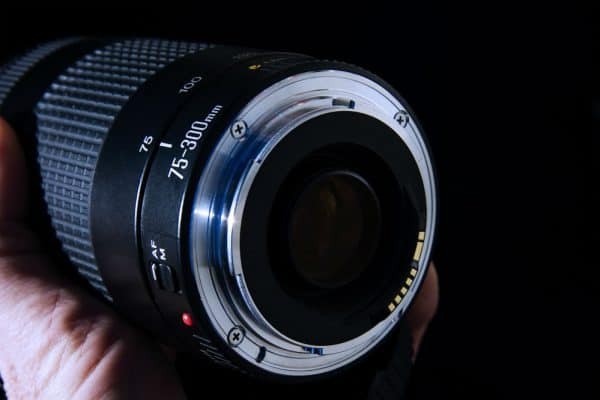 In a nutshell, a mirrorless camera is a camera where the light passes through the lens right onto the image sensor, which then captures a preview of the image and shows it on the rear (LCD) screen. Even though, DSLR (digital single-lens reflex) cameras have more advantages over mirrorless cameras, the latter still have a couple of huge advantages: (a) the size and weight of mirrorless cameras are significantly lower than those of DSLRs, (b) in mirrorless cameras there is an accurate image preview in the viewfinder, and so you will know how close your final image will look like. 2. So, there are 3 levels of cameras: consumer, prosumer and professional. “Prosumer” is like a bridge between consumer and professional cameras, it’s something in between. Prosumer digital cameras are pretty much the same as consumer cameras but they are a step above, with a few features of professional cameras. 3. If you asked the above questions, I assume you are a beginner in photography – if that’s true, I’d suggest you start with cheaper cameras. I mean Sony a9 is great but it carries a high price tag (over $4,000) and second thing that I didn’t like is that it doesn’t have in camera applications and profiles. For those who always use such applications, it’d be a disaster. Otherwise, features are great and this camera is DEFINITELY for shooting pics and cameras for your website/Youtube channel. It will take me a whole day to explain the advantages of Sony a9 haha. But let me tell you one thing – Sony a9 is a camera which was designed to go head to head with Canon and Nikon’s flagship professional DSLRs. In other words, it is a “complete package” for every photographer. 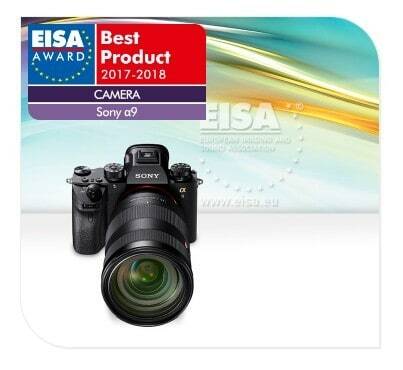 After all, Sony a9 did win the EISA Award 2017-2018 as the best camera. Once again, if you are a beginner, I suggest you first look at cheaper cameras suitable for beginners and bloggers/vloggers. Just because they are cheaper doesn’t mean they are bad. In fact, I created a list of the best cheap cameras to buy in 2017 (see below). Best Cheap cameras: The 7 digital cameras under $500. Wow, my head is just spinning after looking at all the cameras you have written about in this article. There are just so many to choose from. I have always liked Canon camera’s and it looks like a number of them are on the list of the best cameras of 2017-2018. I have a website that I am in the planning stages and want to focus on taking pictures of textures. I have already taken about 200 pictures and the quality is great. Currently, my images are 12 MP, but spending the extra money on a nice DLP will be a wise investment. The Canon EOS 5D Mark IV looks like a great camera. 30.4 MP will be so much better than my iPhone! I do like how you can take videos. I could easily develop a website with videos, too. There are so many bundles offered for each camera though. For instance, battery bundle, free accessory bundle, Speedlite bundle, and storage bundle. I do have a question for you though. Do you think it’s a good option to spend the extra money on a bundle for the camera? Hi Garen, welcome to my blog. Indeed, Canon cameras won a lot of awards this year. And the “fourth Mark” was actually one of my favourites out of this selection. Actually the whole community of professional photographers anticipated this camera. Good choice, my friend. Canon EOS 5D Mark IV is a professional DSLR camera, so both videos and images will be top-quality for your website. By the way, Google likes original and unique stuff (including images), so that’ll definitely work out in your favour. Now, to your question. I am glad you asked this and I will be happy to share my opinion. To attract customers, manufacturers liked to provide the “kits” or “bundles” claiming that you will save your money this. However, more often than not, these deals are not worth it. See, usually the seller adds low-quality stuff in those bundles. For example, the lenses that will be added will be low-value and will be a very short-term accessory. Instead of those bundles, I suggest you pick the accessories that you need on your own, the ones that will serve you for a long-time and, this way, you WILL save in the long run. The Nikon D7500 has me drooling for a new Camera! It sure stacks up to the much larger cameras, but in a much smaller package!! It’s the perfect size for people like myself, who want a ton of features, but don’t want to lug around 100lbs of equipment every time they leave the house!!! I really appreciate how much research you’ve done on all these different brands, it saves me from jumping all over the web and possibly missing out on a great camera. All because of a lack of time to visit the site of each and every brand. One question though… How do I convince my husband that I NEED a new camera??! Hi Janice, welcome to the website. Yes, Nikon D7500 so far is the best prosumer DSLR camera in 2017 and 2018. I understand that visiting each of the brand websites and checking out their best cameras can be time-consuming. And that’s why it’s my mission to make your life easier and deliver the information that you are looking for. This being said, I am really glad I could achieve my mission with this post. In terms of your question – Nikon D7500 is a pretty expensive investment, so you may want to start saying that you will need this camera as a way to make money by selling the images (if that’s what you do, or you can start doing so). The internet gives you plenty of opportunities to sell your images. A lot of people need good quality cameras for shooting for their Youtube channels or blogs. If you do any of those, that’s another reason to invest in a good camera that will last long. Hope I could help and will see you around! This is an impressive list of cameras I would love to call my own. Right now I use the Nikon D3300 to take pictures but would love to upgrade to the Nikon 7000 series. The D7500 looks like a great choice, with the 51 point autofocus and other great features. I see that Canon took home a few prizes, when it comes to cameras what’s your take on the brands? Nikon, Canon… does it matter? Or does it come down to the specs, most camera brands at this level are solid? Thank you a great list! It is interesting to see how different people, the commenters, chose completely different cameras. Which is understandable since everyone’s needs are different. Anyway, good choice on Nikon. 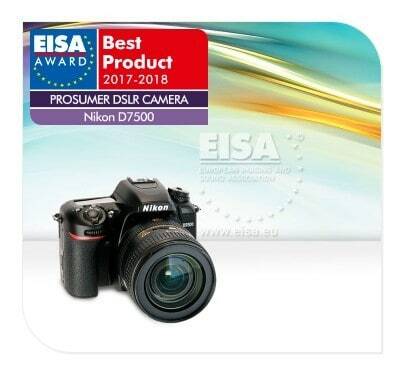 At EISA events, Nikon D7500 was voted as the best prosumer DSLR camera. Since you already have some experience in taking images with DSLR camera, I think this camera is the right choice for you. Canon did take a lot of prizes home this year. I don’t find it surprising though, as Canon is probably the best brand out there. Personally, I enjoy Canon cameras as they show some serious quality photography, on the other hand, Nikon is one of the best brands on the market too and it produces some of the sharpest digital images, as well as provides an exceptional performance in low-light situations. I love to experiment and always look out for the camera with the features that suit my needs best. Was surprised not to see the Olympus OMD E M-1 MK II in that list. I have used DSLRS for over 10 years including one mentioned in your list and after picking up the OMD mentioned above have put away all my DSLRS. The mirrorless system is perfect, compact, sharp and it has the best set of lenses in the market. Probably gives the likes of the pro DSLRs a run for the money. Thanks for your comment. Frankly, I am not sure why they didn’t add Olympus OMD E M-1 MK II to the list. I am not familiar with the process they use to choose a camera and give votes. Maybe, first the manufacturers need to submit an application or something? I don’t know. Either way, Olympus OMD E M-1 MK II is a great camera indeed that’s worth the EISA Award.